A baby in a pram had a miracle escape after a car careered through a shop wall. 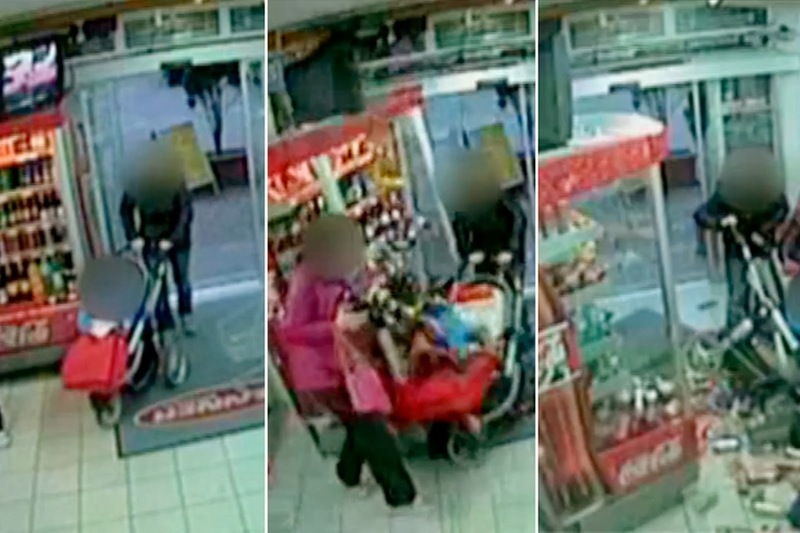 CCTV captured the moment the car smashed through the wall into a group of children and two women - one pushing a pram. Inside the store, in the Swiss canton of Glarus, a fridge was smashed over, hurling glass bottles onto the bay in the pram. Amazingly no-one was injured and the bay escaped without a scratch, just as two women had walked into a discount supermarket in Bilten. The car crashed through the wall just as the children had gone off in search of a supermarket trolley and collapsed shelves and a fridge just as the woman pushes her pram. Store manager Rolf Raschle, 40, said: "They must've had a guardian angel, it's amazing that nothing happened when I looked at the carnage that was left. According to the police there was a concrete post which stopped the car coming any further into the store and without that there would have been serious injuries. If it had been a few centimetres to the left it would have missed it. "The woman with the pram took the baby to the doctors but they confirmed that the really was no injury." The accident was caused by a 43-year-old woman driver who wanted to drive out of the supermarket car park but the accelerator pedal got wedged under the foot mat sending the car crashing into the front of the store. The store was closed for 24 hours while repairs were carried out and the damage was put at around £7000. Manager Raschle said: "The physical damage was easily repaired, I'm just glad that nobody was hurt."